Quick Tips On Staying Cool With Air Conditioning | Inspect A Home, Ltd.
Summer is in full swing and I hope the market is as hot for everyone as the summer’s been!! The time is here again for staying cool and I think the following quick tip may help you when it comes to air conditioning operations. 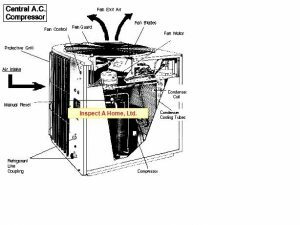 -Since the exterior air is used to cool the condensing coils and then released into the exterior air, then that air being discharged from the air conditioning compressor via the fan exit air ( See Diagram ) is warmer than the outside air Right!! So, if you put your hand over the fan it should be warm.. If it is not warmer than the outside air then this could indicate that servicing is needed. -Always keep your filter clean to increase the efficiency of the air conditioning system. Also, if you do not use a filter, then dust will build-up on the capillary coils and also reduce efficiency. I thought some of you may be interested in just how a heat pump works… But without getting to technical, the air conditioning function within a heat pump system operates the same as conventional air conditioning systems. However, in a heat pump system we can use the same system for heat by reversing the flow of refrigerant. 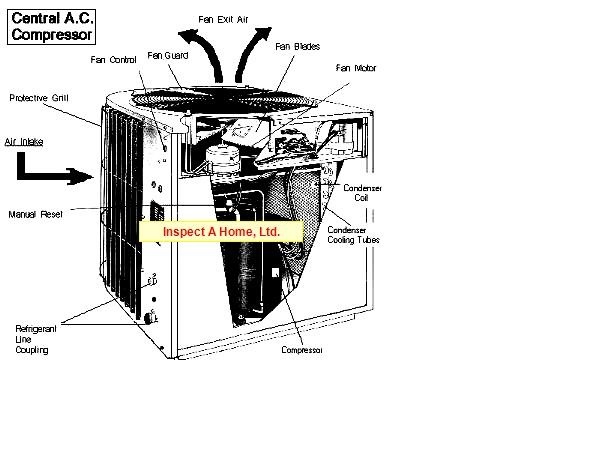 Please take a close look at the reversing valve at the exterior condensing unit . 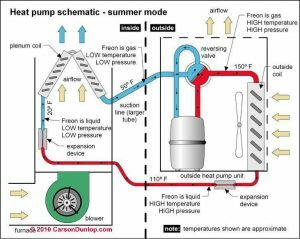 (See Diagram) This valve reverses in the winter to change the direction of the refrigerant flow and is controlled by the thermostat. Although I do not want to get into the coefficient of performance, when it gets to cold outside it’s best to use the auxiliary heat setting on real frigid days. For example, the cost benefit of using the heat pump with an exterior temperature of ” 0 ” Degrees Fahrenheit may not be worth the heat benefit. I hope these tips help and as always, if you or your clients need our services please do not hesitate to call or go to our website for more information. We wish you all the best and hope we can assist you on your next real estate transaction.